One the label photo this is are EP64! This have the additional 128K label on the top? Then it is a upgraded EP64 machine. If you open it: it is have the standard 64K RAM board with DRAM chips. Or this later one with SRAM chips? It is a English machine? They're all English machines, the upgraded 128 is an issue 4 64 with the daughterboard added, standard 4864 SRAMs. 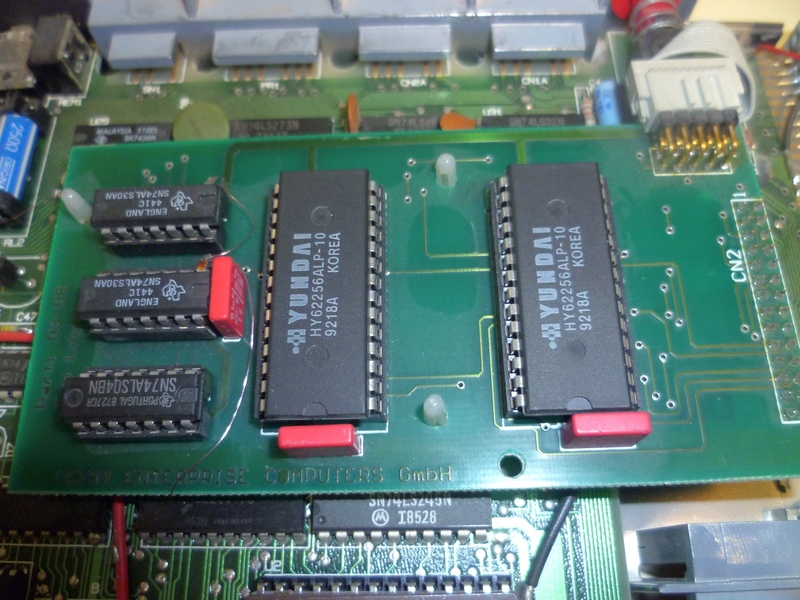 I can't remember which ROM version it's got but I'll be getting a new membrane for my usual 'exhibition' machine then I'll be having another go at getting EXDOS working with both of them. Did you checked the ROM version before the upgrade? As I see this machine also need a pull-up resistors to the data lines. The floating data bus made the phantom non working segments. Yep, it's 2.1 and now in my spares box. I'll see if I can chase down someone who's willing to sell me only a few of those resistor networks, most e*ay sellers want to sell 40 at a time! Nice to have a steady working setup too, pity my floppy drive flaked out at the Recursion exhibition a few weeks ago but it didn't seem to matter, people were just interested in the machine itself. What utility can I use to put DTF images back onto real floppies? OK, RAM pullups added and I found a set of floppy drives ostensibly for the QL (since they have MEDIC written on the plug after the QL disk interface of the same name) but they work nicely for the EP and look the part! Hi Sinclair200, that's an excellent collection of machines and bits, I've never seen another Miracle Systems QL floppy or 512K Expandaram so it's nice to know others are out there. Is the EXOS not upgraded?